Doyle has been a member of the Club since 1962-63 and again in 1995. 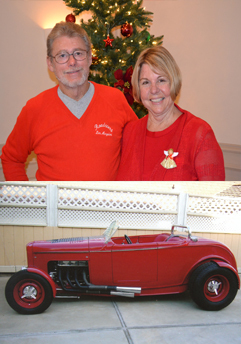 His club car is a 1932 Ford Roadster. He also has a 1932 Ford 3-Window Coupe, 1950 Merc and a 1960 Corvette. Doyle has been the Club Treasurer for 2012 and 2013. Doyle is married to Gloria. He is self-employed and Gloria is an educator. They have a wiener dog named Woofgang. What it means to be a member of the L. A. Roadsters: An opportunity to promote and expand the fun and joy of hot rodding to younger generations and sharing the memories with the older hot rodders.